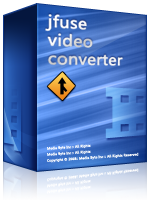 Movie Joiner, Movie Splitter, Video Converter, Audio Converter. Jfuse Movie Joiner, an excellent video joiner to join all powerful video formats. Jfuse Video Joiner, is a powerful video merger to join AVI, MPEG, MPG, VOB, RM/RMVB, 3GP, ASF, WMV, WMA , MP4, MP4a, MKV or FLV files,etc. to one "non-stop" file. With Jfuse Movie Splitter, splitting video files is just a piece of cake. 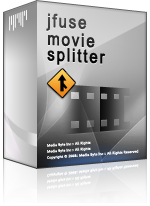 Jfuse Movie Splitter is a powerful video cutter to split, cut or trim a large AVI, MPEG, RM, ASF, WMV, 3GP, MKV, FLV or MP4 Video file into smaller video clips without re-encode. Video splitter and video cutter software has the bulit-in video player, you can easily split/cut AVI, MPEG, RM, ASF, WMV, 3GP or MP4 video file by time or the selection as needed. Jfuse Video Converter is an all-in-one video converter to convert all popular video formats such as AVI, MOV, MP4, FLV, MPEG, VOB, RM, MP4, WMV, and etc. to AVI, MPEG, VCD, SVCD, DVD, 3GP, iPod Mp4, PSP MP4, MP4, .flv/ flash, WMV, and etc.. It allows you to preview video before it gets converted, add watermark, subtitle to your video, convert a batch of videos in different or same formats to one specified format, clip and convert a certain video segment as you like, customize output parameters, and etc.. Four ways to adjust output video frame size are Crop, Stretch to fit , Preserve aspect ratio and Customize as you like. Jfuse Audio Converter is designed for you to extract or convert audio from all popular video and audio formats to fashionable audio formats, such as AAC, AC3, AIFF, APE, AU, FLAC, M4A, MKA, M4R, MP2, MP3, OGG, WAV, WMA, RA and etc. 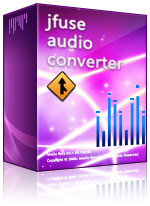 By using Audio converter, you can edit and cut segment you want to convert, set the expected volume of audio, and customize the sample rate, bit rate and channels the audio will contain. Metadata information of the output audio format, such as title, author, comment, album, track, can be customized as you like. Batch conversion is also supported. Our versatile bulit-in player helps you to preview the files in various formats! Jfuse DVD Ripper, rip DVD to avi, wmv, vcd, svcd, iPod video MP4, PSP video MP4. Wanna play your favorite DVD movies on such digital devices as iPod, iPad, iPhone, Apple TV, PSP? Jfuse DVD Ripper can realize your ideas! Our Jfuse DVD Ripper can help you rip your DVD movies and convert them to avi, wmv, vcd, svcd, iPod video MP4, PSP video MP4 and other formats. All of them are compatible with those fashionable tools. 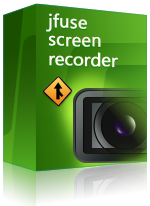 Jfuse Screen Recorder, record what you see, hear, and say. With the latest release of our joiner software, we added MP3 and MPEG splitting. You can now split large MPEG or MP3 files up into several smaller files. This functionality now is included with the standard Jfuse software at no additional cost. Join MPEG, AVI, or MP3 files on your Mac. A new version is due out soon, so be sure to visit our Mac page for the latest updates.